Business is beginning to grow again within Canada, and many entrepreneurs are considering what their next move should be. In a growing company, office, storage and warehousing space can come under constraint, and in turn make business owners eager to rent larger commercial property. Alternatively, businesses should strongly consider the option of constructing a prefabricated commercial building. These buildings are affordable, highly customizable, durable and long lasting – making them ideal for any sized business. Small business owners thinking about their company’s growth strategy should ask themselves – “Why lease a space when I can invest funds into a more equitable growth solution?” The problem today is that too many businesses sink large sums of cash into rental properties each year, when those funds could be used more effectively. The economical solution is to construct a prefabricated commercial building for your business that’ll become an asset on your company’s balance sheet. Initial costs will be higher, yet these buildings can double as an income source through renting additional space to other small businesses. This means that your prefabricated commercial building will generate your company revenue that can be used towards paying off the building’s mortgage, and eventually become a profitable aspect of your business altogether. Instead of simply renting a space, you can design and build a space that will pay for itself and generate income in the future! A medium sized business can benefit just as much as a small business, except there are usually unique demands for this kind of commercial project that small businesses may not benefit from just yet. The most realized benefit for medium businesses is greater streamlined operations within the building. Businesses often construct their commercial space in such a way that all aspects of the company are under one roof, with office space, production, warehousing and distribution together, all working more efficiently. 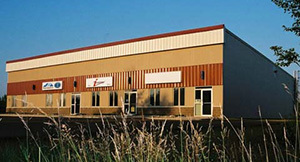 These steel buildings are designed exactly to each business owner’s unique needs, making them the most effective commercial space possible. As well, prefabricated commercial buildings can be built with additional space to accommodate for continuous growth of the company, making it a true long term solution. When it comes to large scale businesses, it boils down to customization that makes prefabricated commercial buildings the ideal choice. They reap the same benefits as the smaller sized businesses, but the ability to design their very own warehouse, office space and production centers are what can drastically improve their bottom line and offer new levels of freedom altogether. 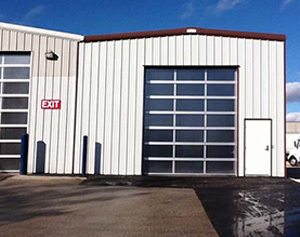 These steel buildings can be built using clear span frame designs, which have zero support beams throughout the interior of the building, allowing for the most flexible floor plans and highest amount of customization possible. Businesses are also able to decide on every design aspect of the building including sheer size, amount of windows, entrances, bay doors, lighting and everything in-between. Meaning, companies will be able to have the most usable space, catered to their exact needs. Aside from customization, the affordability of these buildings is unprecedented. This is due to the fact that there are no costly architectural and design fees, just simply professional project managers who know the ins and outs of the build process, who will build your business the commercial space it truly needs. As per any construction project, make sure you have the proper land zoning, survey and permits ahead of time to help ensure your prefabricated commercial building is built on schedule. If you have any questions on how to go about building your very own commercial building, please feel free to contact us for a more in depth conversation on the building process.